On the way back from my daughter Becca's house in Buena Vista, Colorado, I stopped at a rest stop at the summit of Wilkerson Pass. Everything was covered with a heavy frost and I spent a few minutes taking pictures. 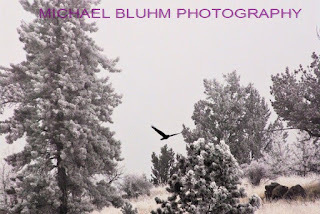 I was walking along and spied a raven flying in front of these gorgeous frost-covered trees and snapped some pictures of it. At Thanksgiving, this area was so serene and quiet, I felt fortunate to be alive and thankful that God created a world full of beauty. This one is my favorite. For anyone who checks this blog frequently, I apologize for my extended absence! My old computer crashed and unfortunately, the only solution was to purchase a new one. I'm back in business now so hope to start posting again. Thanks to those who visit and I hope you find some music, text or photos that you enjoy or motivate you. I appreciate your comments too! I recently received an anonymous comment to my Frank Beard (ZZ Top) post. Take a look.